If the definition of "religion" is the unquestionable belief and worship in a supreme entity, with the obligation to carry out rites and rituals, Buddhism is definitely not a religion. It is beyond all conventional definitions of religion- for Buddhism encourages intelligent doubting and believes in the potential supremacy of the individual. Rites and rituals are seen as ceremonies that help inspire us- they do not give us Wisdom and True Happiness. When the Buddha was meditating to gain Enlightenment, no gods came to reveal any hidden secrets of spiritual power. No one gave Him any religious laws to teach. He said, "I never had any teacher or divinity to teach me or tell me how to gain Enlightenment. I achieved supreme Wisdom by my own effort, energy, knowledge and purity." Likewise, we can attain this highest goal through perseverance in improving ourselves. "The religion of the future will be a cosmic religion. It should transcend a personal God and avoid dogmas and theology. Covering both the natural and the spiritual, it should be based on a religious sense arising from the experience of all things, natural and spiritual and a meaningful unity. 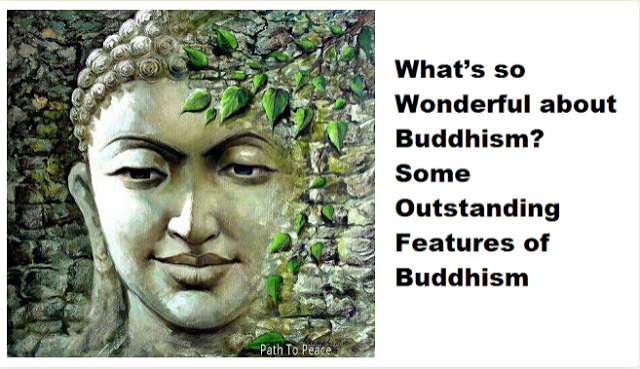 Buddhism answers this description... If there is any religion that would cope with modern scientific needs, it would be Buddhism." Buddhism is a combination of both speculative and scientific philosophy. It advocates the Scientific Method and pursues that to a finality that may be called Rationalistic. In it are to be found answers to such questions of interest as ‘What is mind and matter? Of them, which is of greater importance? Is the Universe moving towards a goal? What is Man’s position? Is there living that is noble?’ It takes up where science cannot lead because of the limitations of the latter’s instruments. Its conquests are those of the Mind." It was neither the history of religion nor the study of philosophy that first drew me to the world of Buddhist thought but my professional interest as a doctor. My task was to treat psychic suffering and it was this that impelled me to become acquainted with the views and methods of that great teacher of humanity (the Buddha), whose principal theme was the chain of suffering, old age, sickness and death." There is no such thing as a just war in Buddhism. The Buddha taught that "the victor breeds hatred and the defeated lives in misery. He who renounces both victory and defeat is happy and peaceful." Not only did the Buddha teach non-violence and peace, He was probably the first and only religious teacher who went to the battlefield to prevent the outbreak of a war. "Go into all lands and preach this teaching. Tell them that the poor and the lowly, the rich and the high are all one and that all castes unite in this religion as do the rivers in the sea"
The Buddha disapproved of animal sacrifice as He saw it cruel and unfair for anyone to destroy any living being for one’s selfish "benefit". There is no concept of "unforgivable sin" in Buddhism. The Buddha said that all deeds are either skillful or unskillful due to the presence or absence of Wisdom respectively. There is always hope as long as one recognises one’s mistakes and changes for the better. "One should not honour only one’s religion and condemn the religion of others, but one should honour others’ religion for this or that reason. In so doing, one helps one’s own religion to grow and renders service to the religions of others too. In acting otherwise, one digs the grave of one’s own religion and also does harm to other religions." "Go forth, O Bhikkhus (monks), for the good of the many, for the happiness of the many, out of Compassion for the world, for the good, benefit and the happiness of gods and men... Let not two go by one way. Preach, O Bhikkhus, the Dharma, excellent in the beginning, excellent in the middle, excellent in the end, both in spirit and in the letter. Proclaim the Holy Life altogether perfect and pure." The Buddha’s teachings form a complete colossal inter-linking syllabus, which covers every timeless aspect of life. The ancient collection of Buddhist Scriptures was said to pile up to "the height of seven elephants". The Buddha expounded for 45 years on all that was necessary to eradicate suffering and attain True Happiness. He asked His assembly of thousands of disciples thrice, on whether they had any remaining doubts before His passing away. There were none.